Heading Back to Flashback Weekend! Ironically, before this site started, Flashback Weekend was the only horror convention I’d ever go to and yet the only one I didn’t attend after the fact. I’m not sure why that is but I’m thinking the numerous July season of events I started covering rendered me both too tired and broke by the time this August one rolled around. In that regard, the circumstances this year were no different if not more so. My friend, Brian Maze, was flying in from Virginia to do both events, meet Svengoolie for the first time, and do a photo shoot with former Crimson Theater hottie, Krystle Street. For those who follow this blog, Brian had been a life saver back in March for Horrorhound Weekend and both he and Russ Wrangler (who would also be at Flashback) proved to be great friends when the Terror Dave’s were at odds. I looked forward to seeing him again although I wished I’d had more energy and resources to make it more memorable for him. As Svengoolie was appearing, it also meant being reunited with some of my fellow “Goolies” Don and Bunny, Jamie Lee Cortese, and Bill & Joan Yingst. No Sir, I was NOT gonna miss this one come hell or high water. I did allow myself to sleep in (sadly, “sleeping in” in my world means 8am) and drove up to the town of Rosemont after 9am which was a mistake as it was already packed with cars and people. I suppose I shouldn’t complain too much about the bumper to bumper traffic since it afforded me an opportunity to “people watch” and observe interesting pedestrians like Iron Man and Batman strolling down the street together. The hotel lot was full so I had no choice but to find a parking garage a block away. I followed a flood of fans out to the main road and saw an interesting Ice Cream truck; a four wheeled advertisement for Insidious 2 (I Scream, get it?). I asked the bored occupants if I could snap a picture and they said it was fine while offering me free ice cream. I politely declined. I made it inside and registered before heading into the main room; set up for both dealers and celebrities. Flashback is one of those rare events that manages to bring in big names while still remaining relatively small; an advantage to its patrons and, considering the monster event going on across the street and what I’d encountered at Fright Night, downright refreshing. This year the headliner was George Romero whose last appearance was when I saw him at Rock n Shock with the other Dave. Romero suffered a stroke since then but looked pretty good. Unfortunately, I did hear that his autographing skills have diminished and that he was acquiescing to his handlers more than usual. 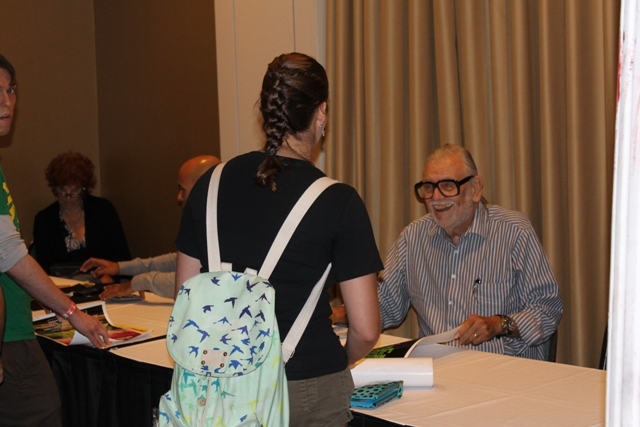 Romero had a reputation for being so fan-friendly he’d overrule his assistants in favor of pleasing his fans anyway that he could but perhaps his declining health demanded he be more reserved. After registering, the first thing I saw when I entered was the booth for Wisconsin PA host, Dr. Destruction, and his sidekick Eyegore; both looking a bit subdued – either because they drank too much the night before or were leery of me after my Horrorhound posts (or a combination of both). I found Brian hanging out by The Ghouligans table off to the right. On this site, Brian’s art work has been featured almost from the very beginning; particularly his horror hosts pogs (which we used in our former “Horror Host Report”) as well as creating the faces for our Terror Dave logo. Lately, however, he’s been less interested in art as he is in photography (something he’s also quite skilled at), particularly focusing on attractive women. 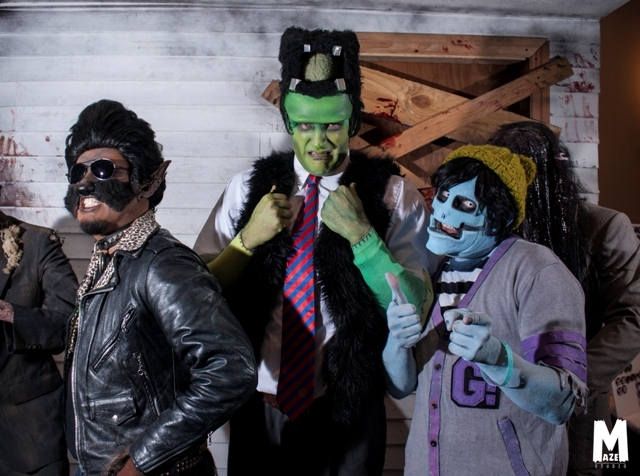 The Ghouligans might not qualify as good looking gals but their costumes certainly make them photogenic to say the least. Brian wanted to stay close to their booth as they got into costume so, after a short chat, I left him to venture out on my own. While doing so, I caught some of the cosplay going on and, presumably, contestants for the big costume contest Svengoolie would later be judging. Those will be featured soon. Since I’d already met Romero twice as well as many of his Dawn of the Dead cast, my main objective in terms of celebrity encounters was with Nancy Loomis a.k.a. “Annie” from Halloween. I saw her line and immediately found my spot at the end of it. While I was there I also saw my friends, and fellow Sven Goolies, Joan and Bill Yingst and waved them over. Loomis’ line didn’t seem that long but took a while since I noticed she took her time interacting with fans…another reason to love Flashback Weekend. This entry was posted in Convention & Expos and tagged DAWN OF THE DEAD, Flashback Weekend, George Romero, HORRORHOUND WEEKEND, Insidious Chapter 2, Nancy Loomis, Svengoolie, The Fright Night Film Fest, The Ghouligans, WIZARD CON. Bookmark the permalink. ← “Day of the Dead” Blu Ray is Zombie Paradise!